Calling all math lovers and pie and pizza pie fans. Pi Day is Wednesday, marking the ratio of the circumference of a circle to its diameter, or 3.14. If you're not a math enthusiast, don't worry, plenty of businesses will offer discounts in honor of the day. Blaze Pizza: Grab a pizza for $3.14 on Wednesday, March 14 in honor of Pi Day. Get more info here . Bojangles': Bojangles' will offer three sweet potato pies for $3.14 all day Wednesday. The closest location to Tampa Bay is in Ocala. More info here . Boston Market: In honor of Pi Day, Boston Market is offer a free pot pie with the purchase of another pot pie and drink with this coupon . The coupon is only valid on Wednesday. Chef Inspired Popcorn: Get a FREE small bag of popcorn with any popcorn pie order. Get more info here . 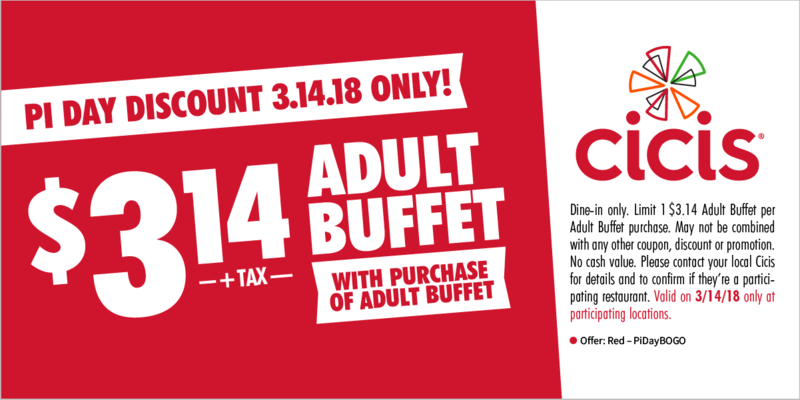 Cici's Pizza Buffet: Buy one adult buffet at regular price, get second adult buffet for $3.14. To redeem the offer, use this coupon on Wednesday. Due Amici Pizza: IT Support Guys and Due Amici Pizza are celebrating Pi Day with pizza and beer. From 5:30 p.m. to 7:30 p.m. on Wednesday, March 14, you can indulge in $3.14 premium slices and $3.14 select draft beers. Get more info here . East Lake Community Library: Celebrate Pi Day and eat lots of FREE pie at the East Lake Community Library from 11:30 a.m. to 2:30 p.m. Get more info here . Lucky's Market Sarasota: Get a slice of pie and a scoop of ice cream for $2. There's also a special on half-pies for just $3.14. Get more info here . Publix: Enjoy free samples of key lime pie at Publix on March 14 from 4 p.m. to 7 p.m. Find a Publix near you . Village Inn: Enjoy $2.00 off any whole pie on 3/13 and 3/14. (excludes cheesecake and carrot cake) Get more info here . Whole Foods: Whole Foods will offer 3.14 off large bakery pies all day Wednesday. If these deals aren't to your liking, many restaurants offer discounts on Wednesdays to drive business. For instance, O'Charley's offers free slices of pie (perfect for Pi Day) with the purchase of an entree; Logan's Roadhouse allows children to eat free; and On The Border has $7.99 fajitas on Wednesdays. To 31 decimal places, the celebrated irrational number that never ends is 3.1415926535897932384626433832795. Note that discounts are available at participating locations, and supplies could be limited.